The first of 3 Dangan shows scheduled for March is "Dangan 95" scheduled for March 4th. The show is a fantastic one on paper and features 7 bouts in total, 2 of which are title bouts. 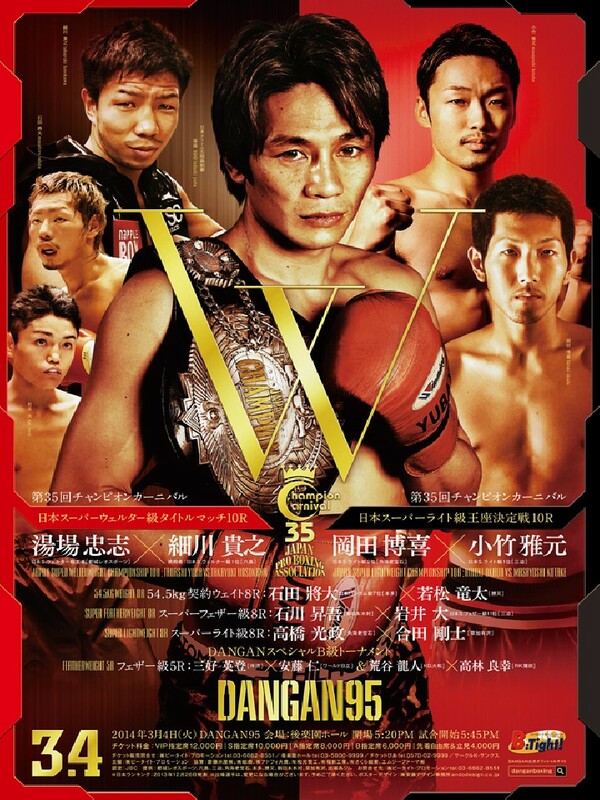 The first, and "lesser" of the title fights is a Japanese Light Welterweight title bout between the big punching Hiroki Okada and the more experienced Masayoshi Kotake. The title, which is currently vacant, wouldn't crown the best Japanese fighter at 140lbs though would act as a clear launch pad for the winner with the previous champion Keita Obara having used it to move on to an OPBF title. Following the Light Welterweight title bout we then move on to the much anticipated rematch between the legendary Tadashi Yuba and Takayuki Hosokawa. Yuba, the first, and only, Japanese fighter to win national titles in 5 divisions, will be trying to make the second defense of his Japanese Light Middleweight title he will however know that Hosokawa really wants revenge for losing a close one to him back in 2011. In regards to the poster it's a pretty decent one. Yuba is obviously the star of the show and takes up much of the poster whilst other fighters from the card are around him and the bouts are all listed at the bottom. It's simple but it works and looks fine with out being outstanding.